This story begins in Spring 2016. I went to Architecture School at the University of South Florida School of Architecture and Community Design in Tampa. Two professors whom I admire, Josue Robles Caraballo and Mike Lemieux, decided to join together to take on the task of putting together a group of students to design and build a home for a homeless veteran. At the time I had only been assigned large scale projects and wanted to look at design for the single user. As a Mexican “anchor baby” my family loves America and everything America has helped us achieve. I went into architecture hoping that with good design I could change one person’s life before the end of mine. The main reason America is the great country it is us because of our veterans who volunteer their better days to defending the countries freedom. It feels like a joke to hear the words “homelessness” and “veteran” in the same sentence. It seems cruel that these people who left to defend our homes came back to find themselves without a home. The class was in collaboration with Celebrate Outreach, a non-profit who works with providing help for the homeless community of St. Petersburg, FL. The task at hand was to create a 400 sq. ft home with $20k-$25k all in all that could become a temporary home and potentially forever home for a homeless veteran. We also had to think of something that can be built simply by students and other volunteers. The city of St. Petersburg and the mayor were in support of the effort and any help they could give because one of the Mayors goals is to end homelessness in the city beginning with the veterans. A lot of funds go into housing the homeless in cheap motels and shelters and feeding them that the city would rather use that money for a better solution. I wanted to answer a question asked too often. What is the difference from a tiny home and a trailer or a tiny house village and a trailer park? To begin with a tiny house can be built on a poured foundation. A tiny home village will always integrate placemaking and well-designed community spaces. Another important difference is attention to aesthetics and quality of materials used in a tiny home. Because of the size of a tiny home, splurging on materials is worth it. Once we got to know what Celebrate Outreach wanted and dove into studying some cheaper and efficient materials, I wanted to look at a simple form that made sense and wasn’t full Zaha or Calatrava level of expense and extravagance. I went back to kindergarten, drawing a house using the square with the triangle roof. The first jury I presented my concept of a light box shell where the home was wrapped in a standing seam metal shell on two exterior sides and the roof with two full polygal windows on the North and South of the home to allow for a well-lit home. The home is a 20 x 20 footprint with a large front porch as an extension of the living space and on the interior the home was divided into four equal parts: living room, kitchen, bedroom bathroom with a sliding partition wall separating the public and private parts of the home. In the first jury the Celebrate Outreach volunteers explained how we needed to be aware of the needs of these homeless veterans including being aware of them suffering through PTSD and disabilities. After the first jury 8 designs were chosen including my own and we were put into pairs. Nicole Harner and I delved into making sure this home felt right. We grabbed some chalk and drew out a full-scale model of the homes footprint and walked the home. We made sure we had our 5’ turning radii throughout. We had the pleasure of having a disabled veteran, Thomas Martineau in our class who let us in on many ideas that could make this home work. The idea of open shelving in the kitchen and allowing a wheelchair to slide under most of the counter space became integral to our design. We also designed a full wet restroom and went with polished concrete flooring throughout the home. The home became a place that could be used as a temporary transition home that when moved out of can be easily cleaned and would not need much maintenance or have the full potential of being someone’s forever home. In the final presentation, Celebrate Outreach chose 4 homes that felt met their design and price needs, including my own. During the Fall 2016 semester, the project was taken on by the Florida Center for Community Design and Research where Josue Robles and other USF SACD professors work with students on urban design solutions. We were on a long hold that had to do with finding the land for the home and the money to build it. The city was willing to give us lots of land that would not fit the footprint of a regular home that are left vacant but could use an infill product to densify the neighborhoods. Being able to place a tiny home within a neighborhood of average sized homes would hopefully allow the veteran to integrate back into society and also clean up these vacant lots being filled with abandoned shopping carts and such. Unfortunately, it’s not as easy as the mayor handing over land. The Minimum F.A.R. for the lots was not small enough to allow our homes. We did eventually have a lot donated to us by another nonprofit, and we spent the rest of the semester fundraising which included going Christmas caroling with the mini home models. During the Summer of 2016 my partner Nicole began working on the Permit Set. In the Spring of 2017, I worked on wrapping those documents up which was a huge learning curve for me. The end of the semester came to a close with another fundraising event which was a traditional Puerto Rican Pig Roast by Josue Robles. It was a huge success and marked the end of the process for me which was very rewarding. 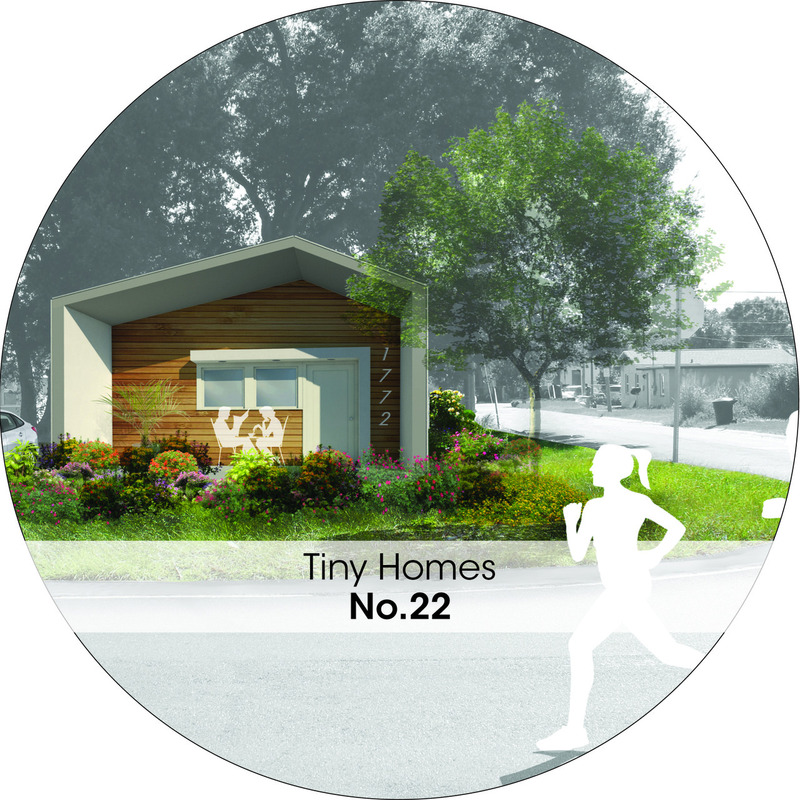 During Fall 2016 positive word had spread around areas in Florida about the St. Pete Tiny Homes and we were asked to present a mini home design for the city of Pensacola who also had some undersized lots and wanted to create housing for middle class people looking to buy a smaller more cost-effective home. The idea of a tiny home or a tiny home village might not be your ideal “American Dream” home but it might be someone else’s only way to attain a place to call home. To view the other 4 designs that will be built through Celebrate Outreach for the Veterans. To contact Celebrate Outreach and donate to help build these homes. To contact the Florida Center for Design And Research and Josue Robles Caraballo about the movement.